Before looking at the scientific miracle which will be discussed in this proof, we want to give some information about the Arabic language. With the help of this information, the scientific miracle to analyze will be understood better. The words in the Arabic language are divided into two categories in terms of gender: the words that are used for female beings are called muannath (feminine); the words that are used for male beings are called mudhakkar (masculine). In Arabic language, things are either muannath (feminine) or mudhakkar (masculine) whether they are animals, plants; objects or verbs. So, in Arabic, verbs are also divided into two as female or male. When the doer of sentence is male, the verb is conjugated as masculine and when the doer of sentence is female, the verb is conjugated as feminine. That is, there is coherence between the verb and doer in terms of gender. 1- In the verse, in order to express the meaning “make habitation”, the word اِتَّخَذِي, (ittakhadhi) which is used for the feminine, is preferred instead of اِتَّخَذْ, (ittakhadh) which is used for the masculine. 2- In order to express the meaning “eat of all fruits”, the word of كُلِي, (kulliy) which is used for the feminine, is preferred instead of كُلْ, (kul) which is used for the masculine. 3- In order to express the meaning “follow the ways of your Lord”, the word of اُسْلُكِي, (uslukiy) which is used for the feminine, is preferred instead of اُسْلُكْ, (usluk) which is used for the masculine. 4- The pronoun “their” in the sentence “There comes forth from their bellies” is expressed with the word هَا, (ha) which refers to the feminine instead of the word هُ, (hu) which refers to the masculine. So, the deeds which are mentioned by the Qur’an as making habitation, that is building the honeycomb, eating of all fruits in order to collect the nectar, following the ways of Allah which is inspired and giving the honey from bellies are performed by the female bee. That is, the doer of all deeds here is the female bee. 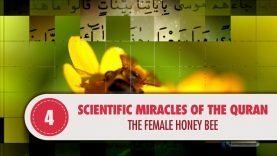 All deeds that the Qur’an mentions are performed by worker bees which are female bees. There is no connection with the deeds which are mentioned by the Qur’an and the male bees. The sole duty of male bees that have huge eyes and have a larger form than the female worker bees is to ensure reproduction with the young queen. Male bees that accomplish this task at the end of summer are thrown out of the honeycomb and die soon as they are accustomed to living with the nursing of female bees. As you see, the news of the Qur’an and the fact science has found in this century is one and same. This fact, which has discovered by science recently but which has been informed by the Qur’an 1400 years ago is a miraculous news of the Qur’an. However, it was impossible for the people to know the division of labour in the honeycomb at the time of the revelation of the Qur’an. The people of that time did neither know that the worker bees were female nor that the works of building the comb and producing honey were performed by female worker bees. However, the Qur’an informed this and the news turned out to be true as it was informed. Is there any other way than accepting the Qur’an as the book of Allah in the face of this great miracle of Qur’an, which amazes people? The Qur’an is the book of the Being who inspires the bee and prepares the honey in its belly. He let the honey be prepared by the female bee, inspired it and informed this in His book centuries ago. Yes, the Qur’an is the book of Allah and His eternal speech. We believe in it and accept it.